Wilford WRK Gyro: The First Rotorcraft with Cyclic Pitch Control and Rigid Rotor System. Photo provided by Kenneth Fietz. Digital Photo By: Kenneth Fietz, Original Property of the U.S. Naval Historical Archives. This gyroplane is an elegant design produced in 1931. The aircraft being a single seat design in a tractor configuration with sleek simple lines and a beautifully tapered four-bladed rotor. The aircraft model identification came from the initials of E. Burke Wilford and German aero engineers Walter Rieseler and Walter Kreiser, upon whose rotor patent (1927) the ship was designed around. Unique to this rotorcraft was the preceding history with the complications of the rigid rotor system. The use of a rigid rotor was attempted very early in rotorcraft development and when these aircraft sat upon the confines of the ground most were able to achieve full rotor speed but when the aircraft started to lift off the ground the effects of dyssemetry of lift would cause the aircraft to roll and impact the ground. It was the advancement in rotor stability by Juan de la Cierva that would make rotary-wing flight practical. Cierva designed the fully articulated rotor, which relieved bending forces and allowed the blades to flap and (later) lead and lag in their position. Cierva’s designs however did not take full advantage of the rotating wing. Control of his autogiros was by conventional control surfaces already in existence on airplanes, rudder, aileron and elevator control. The notable and historic achievement of the WRK Gyro was the practical application of cyclic pitch control. This advancement allowed the aviator to directly control the pitch direction of the rotor disc. This development would improve the agility of the aircraft and later be one of the required technologies needed for the development of a practical vertical lift aircraft, the helicopter. The WRK Gyro shelved the hinged rotor used by Cierva and employed a rigid rotor system with cyclic pitch variation. The ability to vary the pitch or feather the rotor blades in the normal rotation of the blades provides the same affect as the flapping hinges on the fully articulated rotor head in the Cierva design. In this arrangement the advancing blade pitch is lowered to reduce total lift and pitch is increased on the retreating blade to increase total lift. It can be understood that the advancing blade “sees” more lift due to the additional lift from the relative lift due to the forward direction of flight of the aircraft. Similarly, the retreating blade will have less lift due to the blade moving in the opposite direction of travel of the aircraft, thereby; the retreating blade producing less lift. By varying the pitch of the advancing and retreating blades the overall affect creates an equilibrium of lift between the advancing and retreating blades. 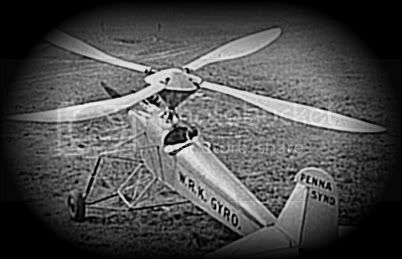 The WRK Gyro became the first aircraft to successfully fly with a rigid rotor system in 1931. Wilford's first aircraft was built with partner Vincent Burnelli and entered for the Guggenheim Safe Airplane Contest in 1927. This aircraft was particularly designed for low-speed landing. Rieseler was born in Berlin, Germany in 1890 and developed a passion for aviation at a young age. Alongside his brother Walter founded an aircraft company in 1920 at Breslau. Rieseler and his friend Walter Kreiser continued to design and experiment with many facets of aviation and on January 24, 1926 the two were awarded a patent for an autogyro. It should be noted that this patent was issued two days prior to the patent issued to Cierva in England. The following year Rieseler and Kreiser built their first autogyro with financing coming from a banker in Hamburg. The Rieseler and Kreiser autogyro was of normal design for the period but they were attempting to directly control the rotor unlike what Cierva was attempting in England. Rieseler wanted to take full advantage of the four blades swinging overhead but after the first test, which showed strong oscillations for which they could not get under control. This design flaw was enough for the banker to back out of any future funding of the project. Rieseler’s work did not go unnoticed however and both Rieseler and Kreiser were persuaded by Professor Alexander Kleimin of the Guggenheim Institute at New York to come to the United States to continue their work. In 1930 the two aircraft designers left Germany to form a partnership with E. Burke Wilford in Pennsylvania. The new company being called the Pennsylvania Aircraft Syndicate or PAS. Work progressed well for the Syndicate and on August 5th of 1931 they rolled out their first autogyro for its first flight. F.P. Brown flew the single seat aircraft and following the successful first flight began a series of modifications to the design, which included replacing the engine with a more powerful type, they shortened the fuselage length and widened the wings. 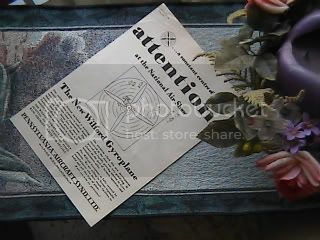 The modified ship was then christened the WRK Gyro with the initials of the Syndicate members. In 1934, Rieseler decided to return to Germany and try and tackle the challenges presented with helicopter development. Walter Rieseler founded the Rieseler and Company in Berlin. Rieseler went on to design three different helicopters, two of which were flown and crashed. The final design the RIII, was not built as in January of 1938 at the young age of 47 Walter Rieseler passed away from a heart attack and the works of Rieseler fell into obscurity. To view the patent of Riesler and Kreiser see patent number 1975124. On February 27, 1929 Mr. William Devaney sold his “Twin Brook Farm” to E. Burke Wilford due to Mr. Devaney’s health. Wilford purchased the property for the purpose of designing and flight testing an aircraft he called the gyroplane. Wilford was one of several early rotorcraft pioneers testing the state-of-of-the-art in rotorcraft design just as were Cierva and Pitcairn. Naturally attempting to secure a place in the aviation industry and reap the financial rewards of their technological advances. In May of 1929, the farm was legally transferred in ownership from Wilford to the Philadelphia-Main Line Airport, Incorporated. Mr. Wilford was the president of this new corporation. Wilford began development of the property to suit his needs and began with modifying the barn into a workable hanger facility. The word PAOLI was displayed on the barn roof to identify the new airport. As this work was being carried out the gyroplane was being completed in New Jersey. December of 1930 the new aircraft was shipped to PAOLI to begin its taxi tests as “Configuration Number 1”. During the next several months Wilford’s engineers and mechanics produced a second aircraft, this second configuration being called the “WRK Gyroplane”. In August of 1931 Lt. Frank Brown took the controls for the first of nearly 200 flights in the “WRK”. This was the first successful flight of any rigid rotor design in the world. Wilford and his team would continue to fly his aircraft from PAOLI until 1932. In 1932, Wilford moved his team to a new site in Essington, Pennsylvania. The new location having formerly served as a seaplane base and World War I training center. 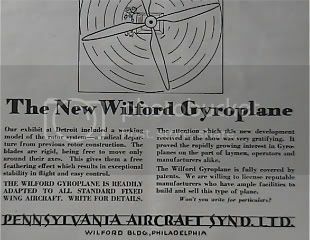 Along with this new location came a new name for his organization and Wilford formed the Pennsylvania Aircraft Syndicate Ltd. It was at this new location where in 1934, configuration 3 suffered from a structural failure that killed the pilot. This tragic event moved Wilford to temporarily halt his gyroplane project. Details from Aero Digest, April, 1935: Pennsylvania Aircraft Syndicate, Ltd., Philadelphia, Pennsylvania â€¢ President: E. Burke Wilford. Chief Engineer: Elliott Daland. Two-place open gyroplane. Kinner R-5 engine, 155 horsepower at 1975 revolutions per minute. Span of fixed wing 27 feet 4 inches. Rotor diameter 32 feet. Length overall 21 feet 4 inches. Height overall 10 feet. Tread 67.5 inches. Wing area 110 square feet. Chord 55 inches. Rotor disc area 804 square feet. Rotor blade area 68.3 square feet. Power loading 12.8 pounds per horsepower. Wing loading 18 pounds per square foot. Rotor disc loading 2.47 pounds per square foot. Empty weight 1455 pounds. Useful load 530 pounds. Gross weight 1985 pounds. Fuel capacity 16 gallons. Oil capacity 3 gallons. Maximum speed 107 miles per hour. Cruising speed 90 miles per hour. Landing speed 30 miles per hour. Cruising range 148 miles. Fuselage: welded chrome molybdenum steel tubing, fabric covered; tandem seating arrangement. Wing: wood spars, dural ribs, fabric covered; strut-braced to fuselage; blades of rotor restrained at hub both in horizontal and vertical planes and are free to twist, or feather, only; opposite blades of the four-bladed rotor are connected rigidly together, so that as the angle of attack on one side increases, that on the opposite side decreases; blade angles controlled laterally and longitudinally by motion of control stick which also controls ailerons and elevators. Tail group: steel tubing, fabric covered; wire braced to bottom fuselage longerons. Fixed type landing gear equipped with 7.50 X 10 Goodrich tires, Autofan wheels and brakes, Fleet shock absorbers. Norma-Hoffmann and SKF bearings for rotor and plane controls. This is primarily a training and utility gyro and can be equipped with Edo twin floats. Instruments: engine tachometer, rotor tachometer, altimeter, air speed indicator, oil pressure gauge, oil temperature gauge. Also see data in February, 1932, and February, 1935, AERO DIGEST. One N2Y-1 was on board Macon in October 1933 when she flew across the continent to her new base at Moffett Field, California. Three others (#s 8600-8602) were then placed in storage at Philadelphia, Pennsylvania, though one of these was converted to an experimental autogyro floatplane (the XOZ-1, Bureau # 8602) in 1935. In 1934 Macon received new XJW-1 utility planes, making the N2Y-1's essentially redundant for their original mission. One of the latter (# 8604) crashed in July 1934. The other two remained in service for a few more years, serving as utility planes with the aircraft carriers Saratoga (CV-3) and Ranger (CV-4). Through everything that Wilford attempted with his autogyro it never gained acceptance among the engineering community at the time but the WRK Gyro was the first rotorcraft to successfully fly not only with a rigid rotor system but also one of the first rotorcraft to fly with cyclic pitch control. The cyclic control provides the pilot a means to tilt the rotor system to provide a direct means of flight control. By tilting the rotor system the gyroplane can be directed for ascending, descending, and banked flight. By directly controlling the rotating wing or rotor system, over conventional airplane flight controls, provides for more precise control and quicker response of input- in short, a more agile aircraft. The employment of the rigid rotor system has seen some of aviation’s most impressive helicopters, the Lynx, Cheyenne and Bo-105 as examples. The rigid rotor system is mechanically a rather simple arrangement but is extremely complex from a structural point of view. In a rigid rotor system the blades are not allowed to lead/lag or flap but can be feathered (through cyclic input). Due to this rigidity of the blades the operating loads must be absorbed in bending rather than through hinges and bearings. All flapping and lead/lag forces are absorbed quite simply by blade bending in the rigid rotor system. The Illustrated Encyclopedia of Helicopters by Giorgio Apostolo, Copyright 1984 by Bonanza Books and distributed by Crown Publishers Inc.
Helicopters of the Third Reich by Steven Coates - 2002 Classic Publications Die deutsche Luftfahrt - Hubschrauber und Tragschrauber by Kyrill von Gersdorff & Kurt Knobling- 1985 Bernard & Graefe Verlag Hartmut Rieseler Dipl.Ing.Mschb.